You can expect to enjoy a concert of Irish and Celtic influenced music played by an accomplished cellist with inspiring depth and vivacity. This entry was posted in Concerts and tagged concert, irish cello, Irish music, solo cello on February 3, 2019 by ilse. This entry was posted in Concerts and tagged concert, Irish music, solo cello on February 3, 2019 by ilse. The new FUAIM series continues this Friday with a solo concert of Irish- and Celtic-influenced music performed with inspiring depth and vivacity by accomplished cellist, Ilse de Ziah. Ireland-based cellist and composer Ilse de Ziah has a deep passion for composing and arranging music for the cello. Using traditional Irish melodies as source material, she creates contemporary arrangements perfectly suited for the cello. With the marriage of classical detail and folkloric tradition, this makes for a transcendent musical experience. This entry was posted in Concerts and tagged concert, solo cello on January 24, 2019 by ilse. 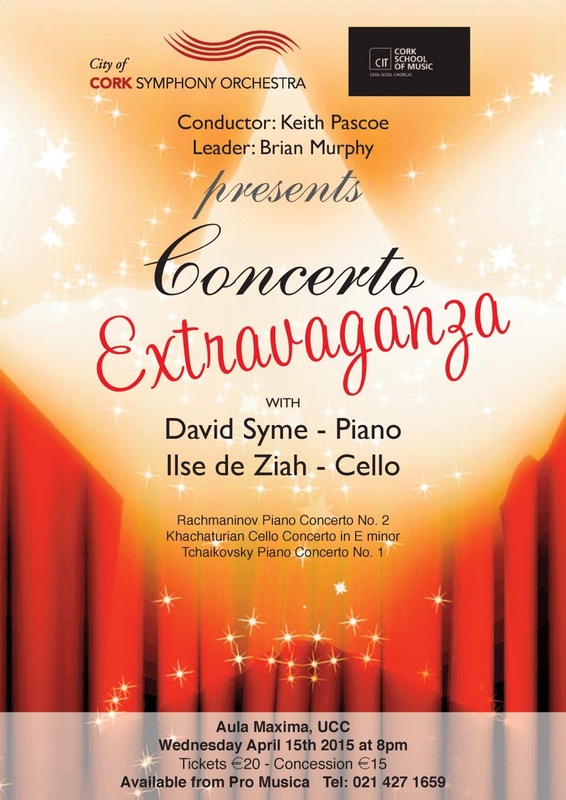 The City of Cork Symphony Orchestra, conducted by Keith Pascoe is proud to present "Concerto Extravaganza!" a concert of three concertos, featuring American virtuoso David Syme, at the Aula Maxima, UCC on 15 April 2015. He will play TWO concertos by Tchaikovsky and Rachmaninoff in the one concert. The third concerto, Khachaturian’s epic Cello Concerto in E minor will be played by Australian cellist Ilse De Ziah. David Syme, American piano virtuoso living in Ireland, has had a long and colorful career. He has performed in Carnegie Hall, Lincoln Center, Kennedy Center, Wigmore Hall, and in major venues in 17 European countries, Canada and Mexico. An alumnus of Juilliard and Indiana University, he was a protégé of the legendary Jorge Bolet. He was schooled in the grand tradition of the great masters, and also studied with Ozan Marsh, Sascha Gorodnitzki, Ania Dorfmann, Louis Kentner and Constance Keene. He has recorded two dozen CDs with such orchestras as the Royal Philharmonic, the Vienna Symphony, and the Czech National Symphony. Since arriving in Ireland in 2005, he has been steadily forging a reputation as one of the finest pianists ever to grace its shores. He is best known there for his “Living-Room Concerts”, held about 25 times a year in his West Cork home on the Beara Peninsula. This series was profiled by Mary Kennedy on RTE Television’s “Nationwide” in 2011. These concerts are social and musical events, with people driving from all corners of the country to attend. One of David’s biggest fans has been the immortal Maureen O’Hara, who prior to her recent move to the U.S., annually celebrated her birthday by listening to him play. Christy Moore, Ireland’s most-loved musician, has been a loyal supporter as well. David Syme performs regularly throughout Ireland and the European mainland as well as in the U.S. It promises to be a great run-up to the CCSO’s Summer concert with José Carreras and Katharine Jenkins in Musgrave Park on 20 June. This entry was posted in Concerts and tagged cello concerto, City of cork symphony orchestra, concert, cork, Khachaturian, Piano concerto, Rachmaninoff, tchaikovsky, UCC on March 20, 2015 by ilse. Home of Munster Rugby and now a new large concert venue! Tickets for this concert are priced at €85. They are available on ticketmaster.ie or can be purchased at Pro-Musica, Oliver Plunkett Street, Cork (021) 427 1659. A huge and exciting event, not to be missed! This entry was posted in Concerts and tagged concert, Il Divo on June 19, 2014 by ilse. We have an absolutely fantastic night of music lined up for ye tomorrow night at this months Medicine Sessions!! Kicking the night off with Ilse De Ziah & her beautiful solo cello performance (one not to miss) Then sit back and let The Shaker Hymn give ye a right dose of medicine with there stunning ensemble. Free In & above The Red House... See you there! This entry was posted in Concerts and tagged concert, lismore, solo cello, the red house on June 12, 2014 by ilse.